As a part of our research into immersive visualization, Olinger Architects teamed up with Feldman 3D and the Metropolitan Waterworks Museum in Chestnut Hill to produce a High Definition LIDAR scan of the historic Waterworks Pump House. Olinger Architects transformed the LIDAR point cloud scan into a series of 360 Equirectangular Panoramic studies that help to demonstrate some of LIDAR's potential for creating instant (raw data) immersive environments. 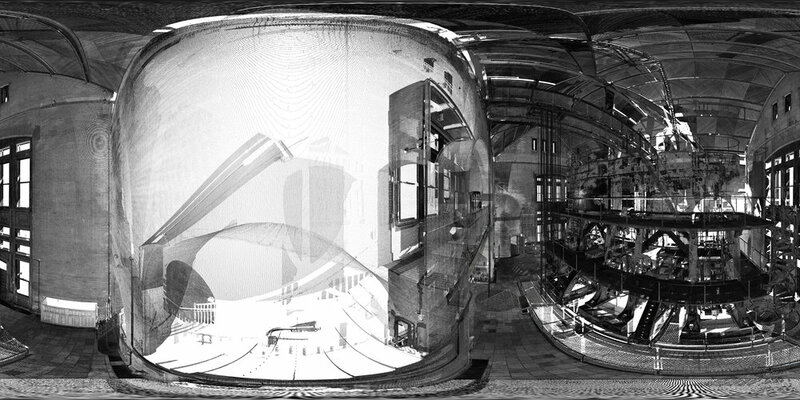 Olinger Architects combined PTGui & Revit to generate the spherical panoramas in this post. The process to create these panoramas is simple, and requires a minor amount of tedium in the camera set up (40 views), but if you can handle a half hour of set up, you can experience hours of enlightened spatial experience. So here is how I hacked Revit to generate an equirectangular panoramic image of a LIDAR Point Cloud. Recent advances in mobile and cloud computing have made highly realistic and interactive 3D environments accessible to the general public. New visualization environments offered by Autodesk A360 and startups such as Modelo provide truly exceptional design visualization, but unfortunately, they have a massive blind spot when it comes to Point Cloud visualization. So how do we find a workaround for viewing our information rich point clouds in Revit? Simple, we use Revit's parametric camera settings to reverse engineer the inputs for a spherical panorama. Below is a step by step explanation for how to do it. Figure #1: The base images for the Equirectangular Panorama are generated by parametric camera views that are batch exported using Revit's native image exporter. Figure #2: Each view captures a discrete cone of vision that tiles into a spherical mosaic of view frames. Each of these frames has been saved to a folder for later access. Figure #4: A section through the Point Cloud scan illustrates the vertical range that corresponds to the view frame. For this study we used (40) Views, with (8) Views at the spherical equator, (8) at 40 degrees, (8) at 80 degrees, with (16) views covering the inverse lower hemisphere, for (4) total views. Figure #5: In this equirectangular projection we are able to see the view range that is provided by a single view tile. Figure #6: The assembled composite panorama depicts the station point cube shown in Figures 3 & 4, with the border region of the assembled view tiles shown in the finer red line. Point Clouds are special, because they provide a highly precise record of a scanned space’s geometry, as well as high-resolution pictorial detail of a space’s color and texture. This makes LIDAR a natural tool for creating highly precise records of historic spaces. Shown here are four views that utilize the LIDAR scans multiple recording modes to reveal more spatial depth and detail than is available to the natural eye. Figure #8: Panorama with point cloud colored by point altitude. Figure #9: Panorama with point cloud colored by surface point normal. Figure #11: Panorama with point cloud colored by point RGB index. The three-dimensional nature of the LIDAR scan also enables us to explore portions of the space that are difficult to access. The Metropolitan Waterworks Museum Pump Hall provides an excellent example of cavernous space that is rendered with extraordinary detail, making it possible to explore the ceiling boards between rafters without a lift. 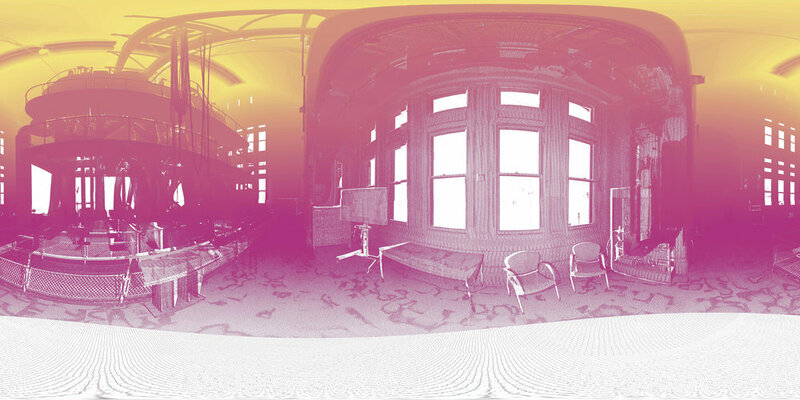 Figure #12: Panorama from rafter space of the Waterworks Engine Hall.